Todd Gold Managing Member, Gennie Shifter By Regis Finn Meet Todd Gold PHB: What was your first car? TG: It was a 1968 Plymouth Road Runner, complete with five different colors, quarter panels that looked like Swiss cheese and slotted Ansen mag rims. It had a nice rake to it, thanks to Mr. Gasket traction bars. I was 14 years old when I first acquired it, (for only $800). It was the closest thing I could get to the car I really wanted, a Dodge Charger, (too many years of watching Dukes of Hazzard!). PHB: What's your dream ride? TG: I am a huge Cadillac fan and love cars from the 1950s and 1960s. My all-time favorite though is a 1960 Cadillac Eldorado convertible with a factory tri-power setup. PHB: Person you'd most like to meet? TG: I have been extremely lucky, being a part of this indus- try, and have met most of the car people I idolized, includ- ing Gene Winfield, George Barris, Bo Huff, Ed Roth, Larry Watson and just too cool Evel Knievel. PHB: If I wasn't in the performance aftermarket, I'd probably be … TG: There's a good chance I would be a politician. I like to have heated discussions! 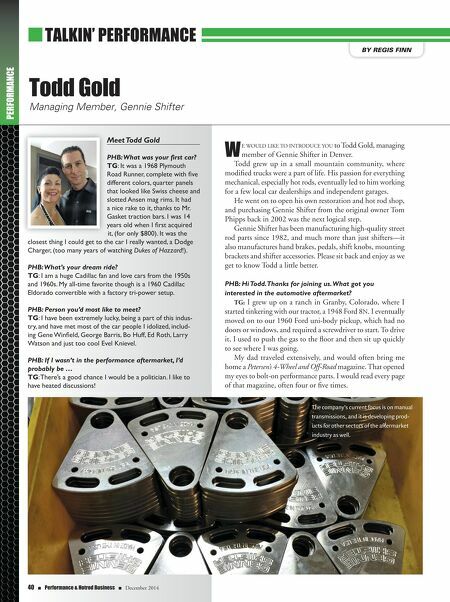 W e would like to introduce you to Todd Gold, managing member of Gennie Shifter in Denver. Todd grew up in a small mountain community, where modified trucks were a part of life. His passion for everything mechanical, especially hot rods, eventually led to him working for a few local car dealerships and independent garages. He went on to open his own restoration and hot rod shop, and purchasing Gennie Shifter from the original owner Tom Phipps back in 2002 was the next logical step. 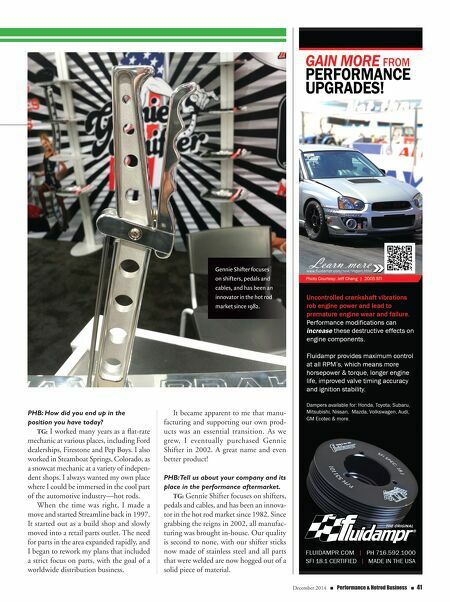 Gennie Shifter has been manufacturing high-quality street rod parts since 1982, and much more than just shifters—it also manufactures hand brakes, pedals, shift knobs, mounting brackets and shifter accessories. Please sit back and enjoy as we get to know Todd a little better. PHB: Hi Todd. Thanks for joining us. What got you interested in the automotive aftermarket? TG: I grew up on a ranch in Granby, Colorado, where I started tinkering with our tractor, a 1948 Ford 8N. I eventually moved on to our 1960 Ford uni-body pickup, which had no doors or windows, and required a screwdriver to start. To drive it, I used to push the gas to the floor and then sit up quickly to see where I was going. My dad traveled extensively, and would often bring me home a Petersen's 4-Wheel and Off-Road magazine. That opened my eyes to bolt-on performance parts. I would read every page of that magazine, often four or five times. n TALKIN' PERFORMANCE PERFORMANCE 40 n Performance & Hotrod Business n December 2014 The company's current focus is on manual transmissions, and it is developing prod- ucts for other sectors of the aftermarket industry as well.